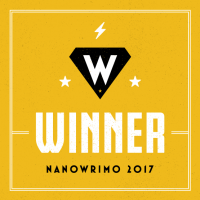 NaNoWriMo 2018: week 4 and I’m almost there! November 28, 2018 November 28, 2018 Leave a comment on NaNoWriMo 2018: week 4 and I’m almost there! So this is it. We’re four weeks in and I have no idea what happened to the time. I have two days to go and, looking at my outline, I’m in a good place. If there’s something I know about NaNoWriMo it’s that I can do this. 50K words in a month isn’t a huge deal for me. I’m a fast typer*. What I don’t know, and looking at my previous posts, I’ve never known, is how to tell a story. So why do I do this? If the first week was all about loosing time and track, the second week is where I found I know how to do this and caught up. I’ve got a draft short story* and am working my way through the meat of my plot. I’m a little ahead of target (just as well, because I’ll lose Saturday to roller-derby). New year’s resolutions aren’t really for me but I made a promises to myself that I think will be useful: For the next six months, I’m not buying new books. Gasp! Recently I attended a workshop on setting creative goals given by writer, journalist and writing coach Kaite Welsh. The purpose was to learn how to set goals and start putting some in place. A close look at my stats show that I front-loaded the month of writing. This is a direct effect of having carefully reviewed only part of my outline before I started. The important thing is that I met the goal. I’m still ahead but it’s getting a lot more difficult. It took a while but I’ve figured out why. The last time I did NaNoWriMo I was panicking at this point (and enjoying myself hugely). We’re halfway through the month, take a day, and I’m 30K words in. I’m ahead: if I continue like this, I’ll reach 50K on November 24th. I still feel chill.